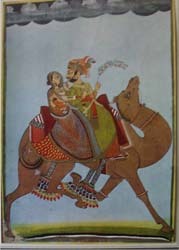 1981 print of Dhola and Marvani riding their camel, marwar, original was made in 1820. This is nice print taken off the origina, you can see the disoloration of the original in the print. It has gold on it and looks old even though it is not. It was made for a calander. Ready to frame, shiping is 77 cents if in the USA. 9 1/2 x 6 3/4""
Items Similar To "1981 print of Dhola and Marvani riding their camel,"